Home is the first school and mother is the first teacher of child. Innate talents of a child, emotional and social in particular, get nurtured by the loving care given by the parents to their child. good habits and moral values are picked up by children from their home environment. Good parenting gets reinforced by good-schooling. Prestige Public School, Indore plans to have workshops and seminars for parents on good-parenting. 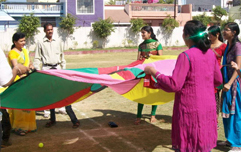 Prestige Public School believes in meaningful and free interaction between parents and teachers. For this, provision has been kept in the school calendar where both can meet formally and informally. Parent's suggestions, if educationally sound, are implemented.